The Boker 2020 provides two premium Solingen steel blades. The Boker 2020 is a large knife that provides extra utility thanks to having two 4" blades: a clip point and a skinner. While it is larger than your average folder, the extra size is nice for the outdoorsman who wants a premium German knife that offers the extra safety of folding blades. Durable and dependable, this knife has all the quality you expect from a German made knife. and the length of the knife when closed is 5 1/4". This rugged knife comes with a leather belt sheath. 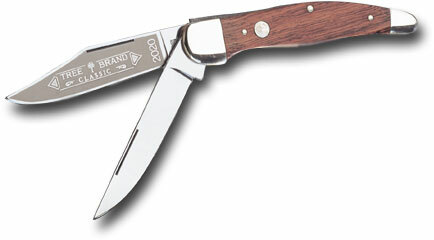 This heavy duty Boker folding hunter is very attractive, sporting Rosewood handle scales, which are held firmly in place by a pair of nickel silver bolsters. As you would expect with German craftsmanship, the handle, like the rest of the knife, is designed to last a lifetime. The Model 2020 definitely has a tough 'personality', is a world class work and woods knife, and would be about perfect for the outdoorsman who likes good sized hunting knives, but doesn't want a fixed blade. Take a close look at one at your favorite knife shop, and see if you don't agree. Return from Boker 2020 to the German-Knife.com home page.